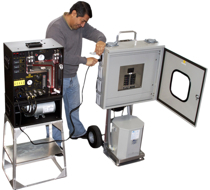 CleanAir's UL Listed Mobile Power Distribution Station is a safe temporary 120/240VAC single split phase system perfect for most field service applications. The portable power unit is mounted on a sturdy aluminum two-wheeled cart for easy maneuvering, even on rough terrain. It converts a single-phase 480VAC input into multiple 120V and 240V receptacles to power your entire field operation. Each of the sixteen (16) 120VAC outlets is GFCI breaker protected providing for safe outdoor usage. 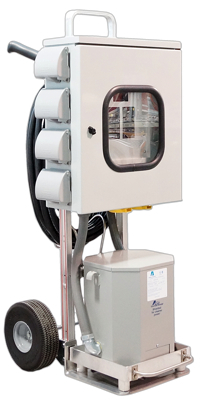 The two (2) 240VAC outlets are equipped with heavy duty locking receptacles, and all the circuit breakers are encased in a NEMA 3R weatherproof breaker box with window. 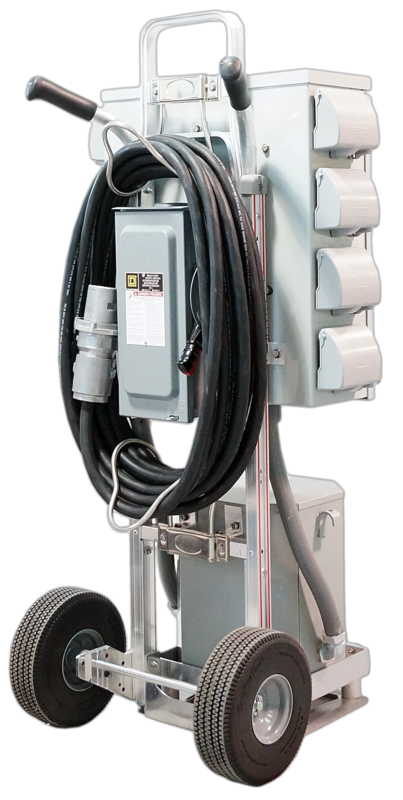 When your field operations require power to several locations at one time, where standard electrical service is not readily available, no other solution compares to this Mobile Power Distribution System. Custom options on voltage and power connections.